Four Media Arts + Practice students were featured at the most prestigious art and technology festival in the world, ARS Electronica Festival for Art, Technology and Society. This achievement represents one of the highest honors for students in the field of multimedia arts. The annual festival was hosted at the POSTCITY multi-media museum in Linz, Austria in September. This year’s theme was Artificial Intelligence—The Other I, which focused on the future of AI and its cultural, psychological, philosophical, and spiritual aspects. The five-day event hosted various conferences, lectures, workshops, exhibitions, projects, events, concert, performances, and more, and MA+P students work was featured across several categories. MA+P Chair Holly Willis said that considering MA+P’s relatively small student body (the division is SCA’s newest and smallest), having four students featured at the world-famous event is a momentous achievement for the department and shows the exceptionalism of the program. “I am doubly pleased because all four of the students accepted into Ars Electronica are women. Given that we only have 20 students currently in the entire program, the fact that all four made it into this show is phenomenal,” she said. Given that we only have 20 students currently in the entire program, the fact that all four made it into this show is phenomenal,” she said. The MA+P students featured at ARS Electronica include Juri Hwang, Behnaz Farahi, Noa Kaplan, and Nonny de la Pena. Their works were featured in various exhibitions, installations, publications, and events throughout the festival. At the festival, MA+P PhD candidate Juri Hwang was awarded Honorable Mention for her project Somatic Echo, a bone conduction sound installation that examines how the body interprets sound. With Somatic Echo, the listener is enveloped in a multi-sensory sonic experience that immerses her into the soundscape. Behnaz Farahi was invited back to ARS Electronica for the second year in a row. 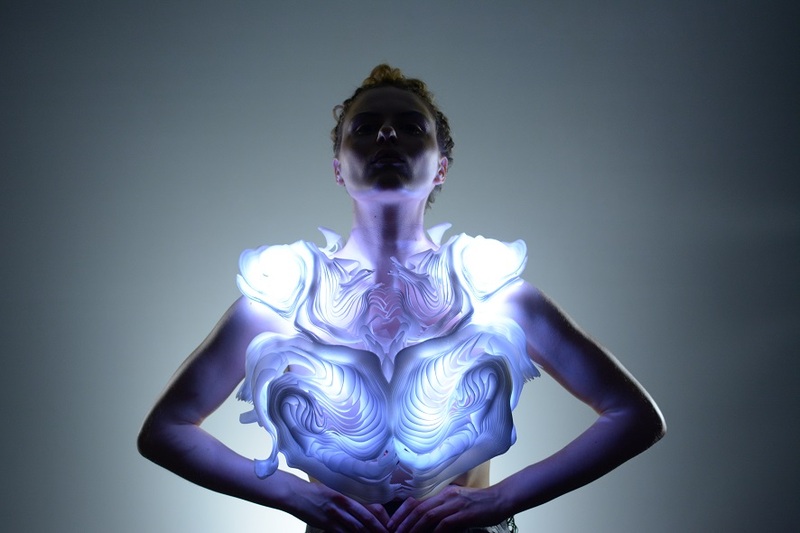 At the festival’s POINT ZERO exhibition that questioned the essence of human beings, Farahi showed her project Bodyscape, a top that tracks bodily movement with LED lighting. Her work at ARS Electronica was featured on the cover of Creative Austria. At the festival, Farahi also presented Synapse, a helmet that illuminates based on brain activity. Noa Kaplan participated in the Feminism and Climate Change: Beyond the Binary event with her project Cyborg Portraits that questions female cyborgs’ defying of traditional patterns. Kaplan showed the first installment of Cyborg Portraits, which compiles footage of Dolores from the first season of Westworld using superimpositions, time-lapse, juxtapositions, and more. Ph.D. candidate Nonny de la Pena and her company Emblematic presented a virtual reality experience Out of Exile at the festival and earned an Award of Distinction. Out of Exile combines audio and walk-around virtual reality to create an immersive story about the hostility many members of the LGBTQ community face.